If you are from Barcelona or have visited there, you know that this cake is actually known as pinch bread, because originally it was baked in a loaf shape. Now, however, it usually appears as tall cupcakes encased in wings of parchment. The name is derived partially from the recommended way of eating it: pinching out pieces of the fluffy cake between your fingers. This most exquisite of all versions is called Salt because it was created in 1985 by Miquel B. Costabella, baker and pâtissier of Salt Bakery, which was named after the village of Salt, close to Girona, Spain. 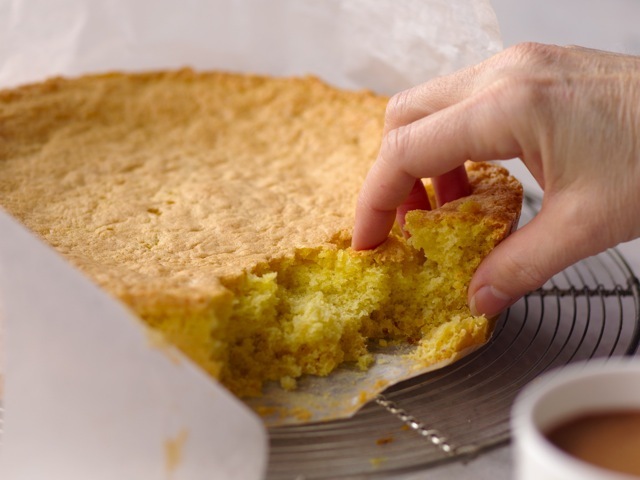 What makes the recipe so special is the substitution of almond flour (finely ground almonds) for most of the regular wheat flour, which results in a more spongy, moist texture and an almond-imbued flavor. Preheat the oven: Twenty minutes or more before baking, set an oven rack in the lower third of the oven and preheat the oven to 325 degrees. Prepare the pan: Coat a 9-by-3-inch springform or cake pan with shortening and line the bottom and sides with parchment paper. For the sides, cut a 33-by-3-inch band of parchment paper, overlapping an extra piece if necessary to make it long enough. Wrap and press it against the inside wall of the pan. Use some extra shortening to coat the overlapping ends to hold them in place against the first strip of parchment. Toast and grind the almonds: Spread the almonds evenly on a baking sheet and bake for about 7 minutes, or until pale golden. Stir once or twice to ensure even toasting and avoid overbrowning. Cool completely. In a food processor, pulse the almonds and 2½ tablespoons of the sugar until as fine as possible. Stop before the nuts start to become pasty. Prepare the eggs: Pour the whole eggs into a 2-cup measure with a spout and whisk them lightly to break them up. Mix the meringue: In the bowl of a stand mixer fitted with the whisk beater, beat the egg whites on medium-low speed until foamy. Raise the speed to medium-high and beat until soft peaks form when the beater is raised. Gradually beat in the remaining sugar, stopping the mixer once to scrape down the sides of the bowl. Continue beating until the meringue is very thick and glossy, but it will not be smooth. Detach the whisk from the mixer and use it to stir the almond mixture into the meringue until evenly incorporated. Make the batter: Reattach the whisk beater and, with the mixer on medium speed, add the beaten egg to the meringue 2 tablespoons at a time, beating for 2 minutes between each addition. It should take a total of 20 to 25 minutes, but be sure to beat for a minimum of 20 minutes. Beat in the lemon zest. Remove the bowl and beater from the stand. While the mixture is beating, weigh or measure out the flour. Sift the flour onto the batter and, using the whisk beater or a large balloon whisk, fold in the flour until fully incorporated. Reach to the bottom of the bowl and be sure that no white specks of flour remain. The best way to accomplish this is with your fingers, pinching any bits of flour to moisten them. Bake the cake: Bake for 25 to 35 minutes, or until a wire cake tester inserted in the center comes out clean and the cake springs back when pressed very lightly in the center. The cake will rise just a little and then sink slightly in the center. Unmold and cool the cake: Set the pan on a wire rack and immediately loosen and remove the sides, leaving the parchment attached to the cake. (If using a solid pan, lift the cake out using the parchment and set it on the wire rack.) Allow the cake to cool until it is warm or room temperature, about 1 hour. Serve the cake: Set the cake, still in the parchment, on a serving plate. (Leave the parchment in place until the entire cake is consumed.) Delicious eaten in the traditional way by pinching out pieces of the fluffy cake, the cake is also lovely for a tea: Serve pinched or sliced with fresh raspberries and lightly sweetened whipped cream. Sliced almonds are easiest to grind powder-fine without having the oils start to separate and make the nuts pasty. If only slivered or whole are available, grate them first before processing. Unblanched almonds (i.e., the brown skin has not been removed) add flavor and color to the cake, but the cake is still delicious if made using blanched almonds. The cake keeps wrapped airtight for 1 week at room temperature, for 10 days refrigerated, and for 6 months frozen.